This part is going to be a bit mathematical with « physical approximation 😀 ». Zack Waters : Irradiance and flux. As I have promised the last time, I have started again from the beginning my engine. I am going to explain why I had need to change my architecture, and explain my differents choices. 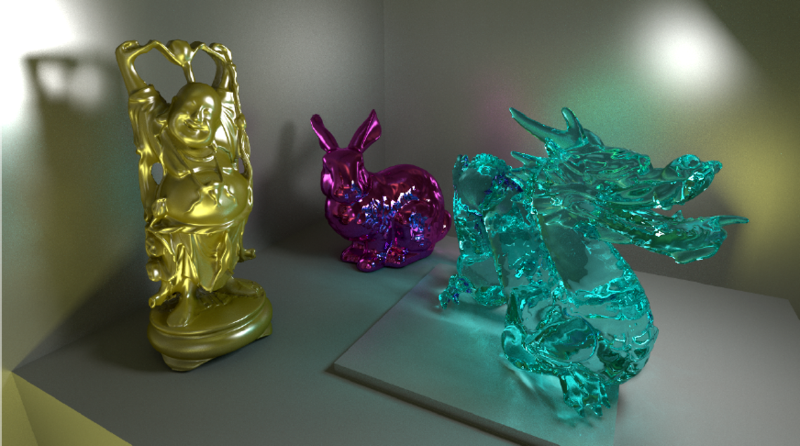 To begin, after thinking a lot about Illumination in real time, I found that it’s not useful to have Global Illumination, with no « correct » direct illumination. That’s why, I will implement a Phong Shading gamma correct. About performances, my old code was very very bad (you can see the proof after), I had to implement a powerful multi stage culling. Moreover, I had to use the latest technologies of GPU to increase performances. Therefore, I am using Compute Shaders, Bindless Textures, Multi Drawing. For the beginning, I will explain how my engine works internally. I am using several big buffers, for example one which contains all of Vertex, another one which contains all of Index, Command, and so on. The Matrix, Command, AABB3D buffers are filled in each frame. After, a view frustrum culling on GPU is performed, therefore, the Command Buffer is also bind to SHADER_STORAGE_BUFFER and INDIRECT_DRAW. After culling, a pre Depth pass is performed and, finally, the final model pass is performed. We will see the details later. To have a certain coherence in the scene, like glasses on cupboard, if you move the cupboard, your glasses have to move as well, you have to have a scene graph. To do that, I already explained that I am using a system of Node. But now, I have improve this model with one obvious feature. If the Parent Node don’t have to be render, I will not render the children Nodes and Models as well. My system is decomposed in 3 Objects. One SceneManager, One Node, and one Part of this Node (There may be several kind of Part (lights for example is another part)) : ModelNode. It is the Model Node. 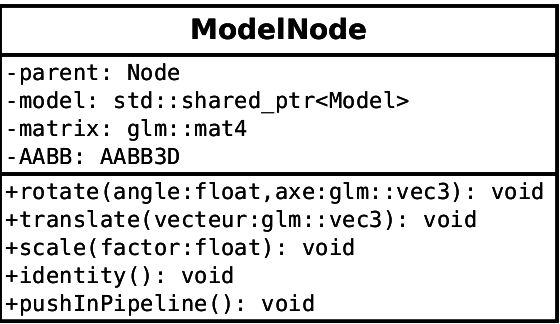 It is a part of a Node which contains a class like « pair » between one Model and One Matrix. – One bounding box in World Landmark (it depends of the Global Matrix of the parent Node). 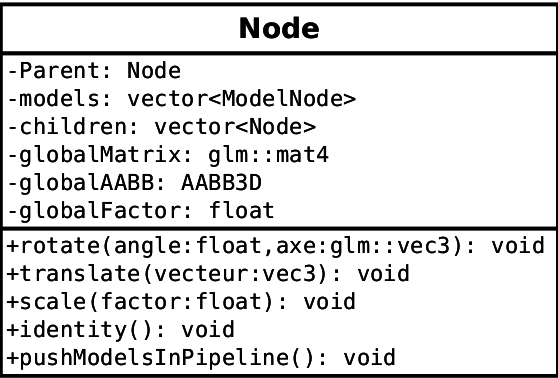 – One matrix which contains a relative landmark on the Global Matrix of the Parent Node. If one transformation is performed by this Object, the bounding boxe for the ModelNode and the bounding boxes of « all » parents Node are recomputed. The function « PushInPipeline » can be strange for you, that is why I am going to try to explain you its role. As I already said, I have several big buffers, this function will modify few buffers, like Matrix, bounding box, and commands buffer. You have exactly the same number of Command, AABB, and Matrix. It’s not obvious to have exactly the same number for Matrix and Command, for examples, if you have one model with 300 meshes, you have, normally, 300 commands, but one matrix. In my system, you have therefore 300 matrix. After you will see why. The Node object is a root of a Sub-Tree in our Scene Graph. Each child of a Node depends of a Landmark of this root, and the bounding box of this root depends of childs bounding boxes, therefore, the building of this « tree » may be one down approach (if a Root transformation is performed) or one up approach(if a child transformation or Model transformation is performed). -a globalFactor : It is a global scale factor (useful for the future lights if scaling Node). 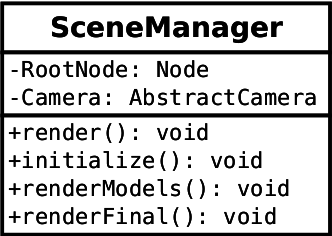 As you can see, the Scene Manager contains two objects, one pointer on Node and one Camera, the last one is not important here, and it can may be move later to Node for example. The objective of this class is to give to user one interface to render all the scene, here, it doesn’t matter the lights, but later, we can add renderLights for example. The function render call succesively initialize, renderModels, renderFinal, the function initlalize update Camera Position and Frustrum, and « reset » our pipeline, the function renderModels render all Models and material information on FrameBuffer, the last one function draws the final texture on the screen with post processing. Wait, it seems like highly to the « normal » pipeline, right? Yes, but now, we can improve performances with pre Depth Pass and View Frustrum culling. What is View Frustrum Culling? 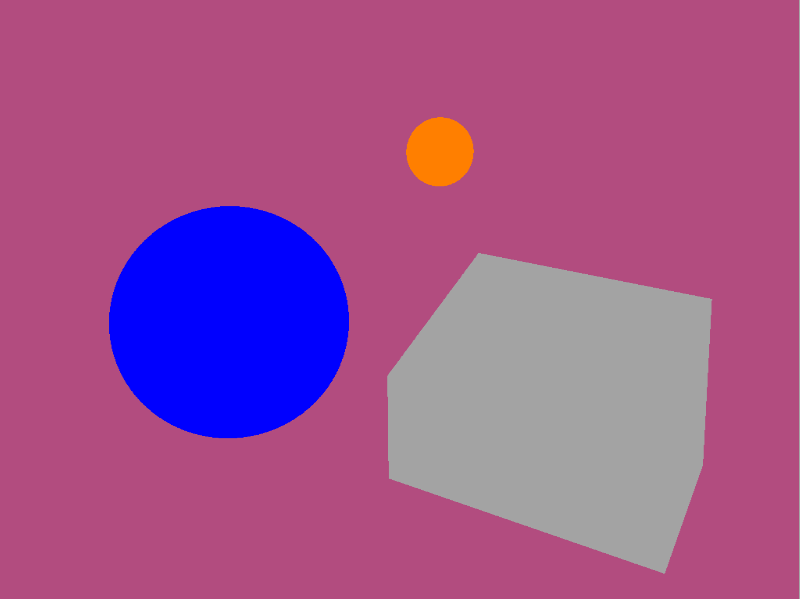 The idea behind this term is to reduce a number of « Draw Objects » in this frame. So, you will test if the object is or not into the Camera View, and if not, you don’t render it. How to perform efficiently this culling? For one unaccurate culling, you have to perform test on the CPU. Globally, this test is perform in the Node function pushModelsInPipeline. To have a really accurate and efficient culling, because you have a high number of bounding boxes, you should use your GPU to perform culling. So, a good combinaison between Draw Indirects and Shader Buffer storage will be your friend with the Compute Shaders. A pre Depth Pass is to avoid to render on the color buffers data that you will change with a nearest object. So, the rendering take 2 passes, but it is, in general, most efficient :). As you can see on this picture, the performances gave by culling are almost constant, but a Pre Depth pass performances depends of the size of FrameBuffer’s textures. We gain nearly twice performances with pre depth pass and culling, but if you have a higher number of objects (here is just Sponza drew), you will earn too much performances :-). See you next time :-). Hello there. I am sorry that I have not written since long time ago, but I had to pass my exams ^^. 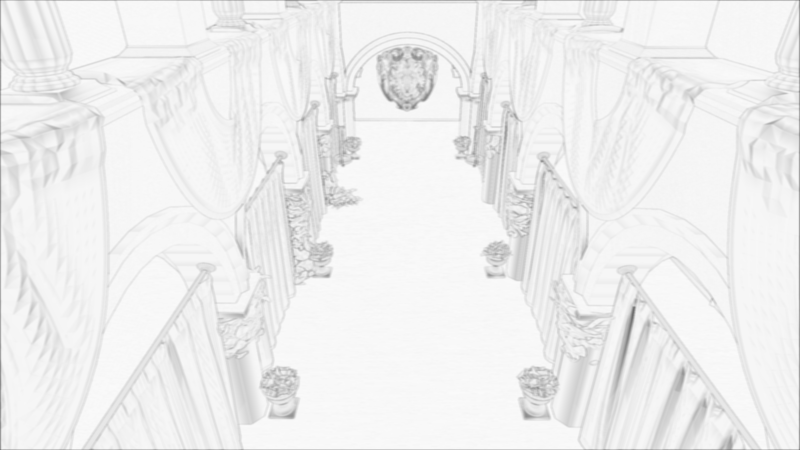 So, what is ambient occlusion? 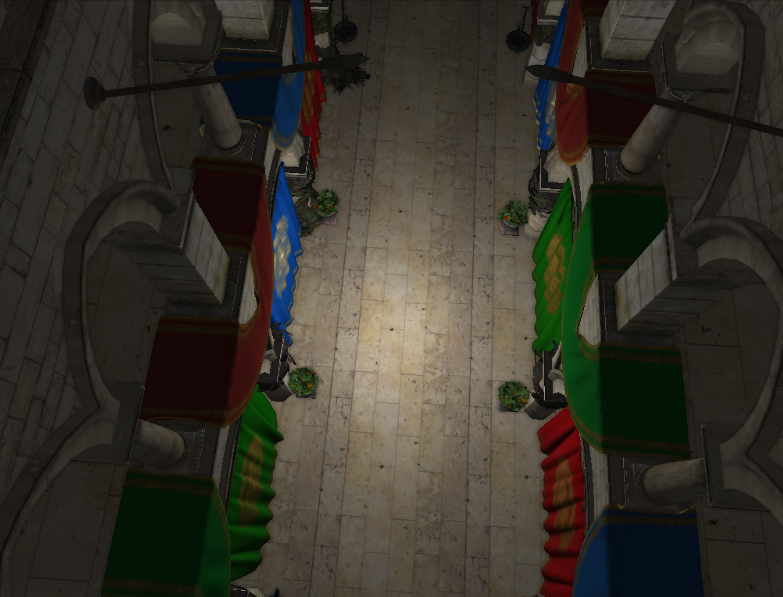 There, we can see respictively : No ambient occlusion, occlusion map, and rendering with ambient occlusion. So, Ambient occlusion allow to improve shadow in the scene. Ohhhh, it’s a very difficult formula, with a strange integrale. We are going to see how we can get one formula in this kind. Obviously, we can say that one orthogonal ray to normal is not influent compared to one parallel ray, so, we can introduce a dot product between ray and normal into the integral. We do not perform this integral in all hemisphere, but only in the hemisphere’s surface. I remind you that the infinitesimal surface of sphere is . K is the constant as we have to compute, because ka have to be ranged between 0 and 1. So, now we can try to compute K, with the view function always to 1, because we compute the case with no occlusion is performed. For people who like so much rigourous mathematics, I know it’s not very rigourous, but it’s with this « method » that we will compute our occlusion factor :). 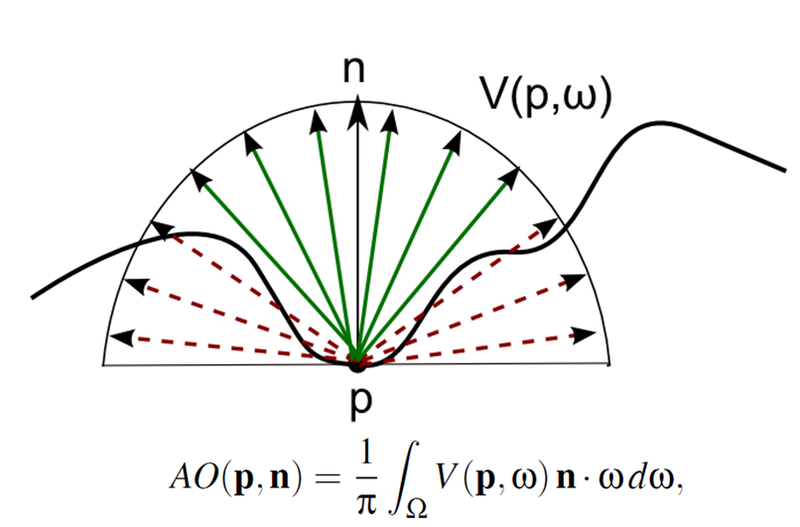 If you prefer a more accurate technique, you can integrate in all Hemisphere (with the variable radius and take a view function who return one value between 0 and 1 according to the distance of occluder from the origin of ray) and, you get exactly the same formula cause you do one thing like this : with is from the View function to limit the return value from 0 to 1. 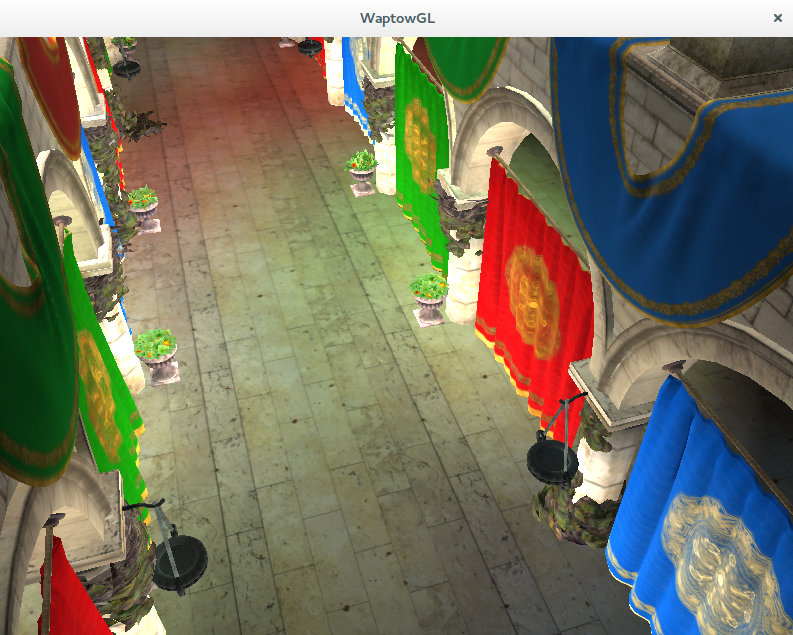 After that, we can blur the occlusion map to improve its rendering. So we just use a simple blur. Now, we have to code our ambient occlusion. This picture is very good to understand how we can use our approximation. Indeed, there, we can see that if the point is red, we have , so You just have to test the depth buffer to know if the point is occluder or no. Strangely, in this case, if I use shared memory, I have badder result than just texture. 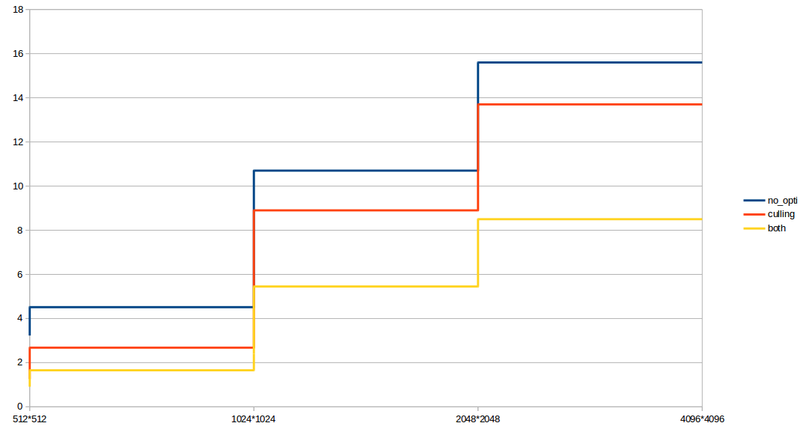 Maybe the allocation of shared memory is longer and it’s not very efficient here :-). I advise you to use texture instead of imageLoad, indeed, I get 8 times performance better with texture ^^. Bye :). The next time, we will talk about shadows ! Hello there. I have not written since few weeks, so I’m sorry. So, now, I’m going to explain why I leave the ray tracing concept for the rasterization (again?). To have an efficient ray tracing, you need a good structure with tree, but, the problem is that having a tree on GPU is not easy. Indeed, GPU does not have a call stack and pointer. So, for the rasterization part, I keep the same model, with 4 textures (Diffuse, pos, normal, distSquare) into FrameBuffer. Now, to add lighting, I can add another FBO with another texture. 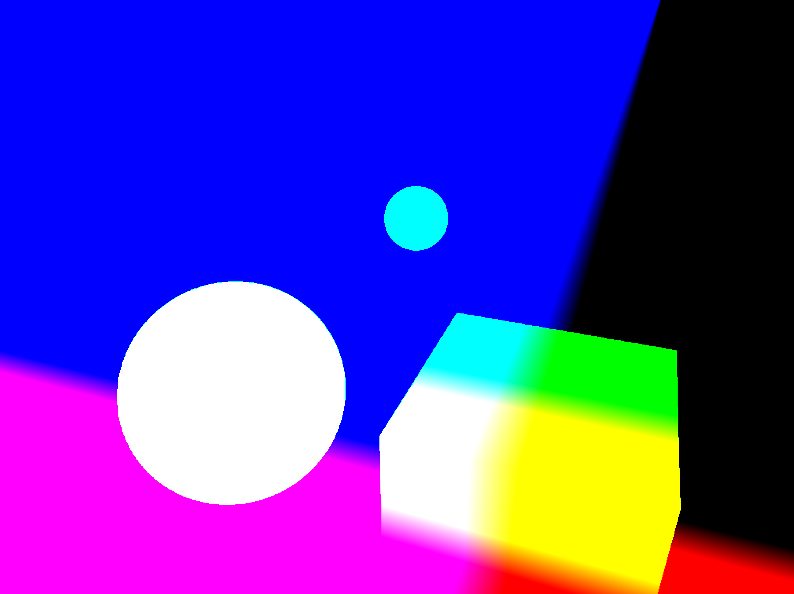 This technique is called : Deferred lighting (or shading). The main advantage of this technique, is, instead of computing lighting in all pixel in the screen, you compute lighting only in pixels that are affected by lighting. For example, if your lights are placed in the center of your screen, with a radius of 100 pixels, your lighting is computing of 10 000 pixels instead of 2 000 000 (in FULL HD). So. I am going to explain how to create a deferred lighting for point light. Indeed, to have a spot lights, or globe light, It’s more difficult. Really, I don’t know for globe lights, but for spot light, you have to create a cone, with a good « angle ». 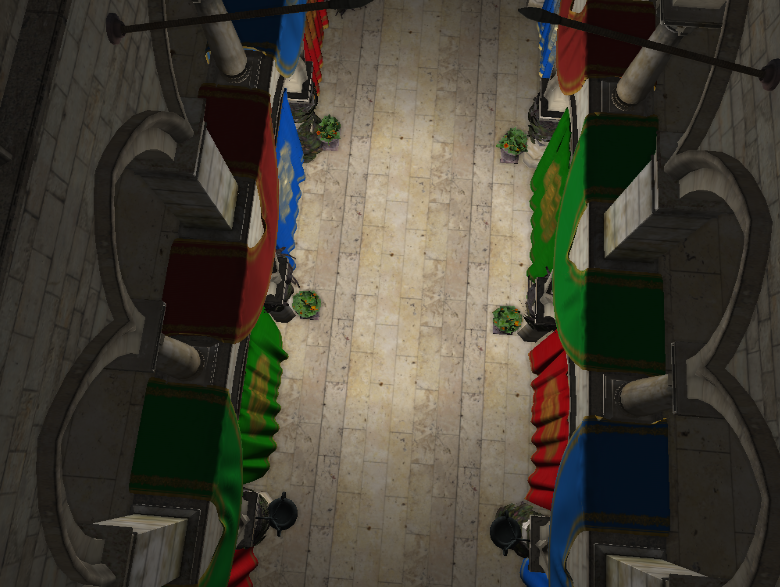 If you want to know more about globe lights, you can go here Nvidia GPU Gems 3 : Tabula Rasa . So, it exists many techniques about deferred lighting. I am going to explain how my engine works. I began to introduce how my light’s system it’s implemented. The matrix projectionViewModel is a matrix used to « project » our lights in the screen to avoid compute lighting in pixels « useless ». Remember, I saw on the last article, I store my Positions and normals in Frame Buffer. 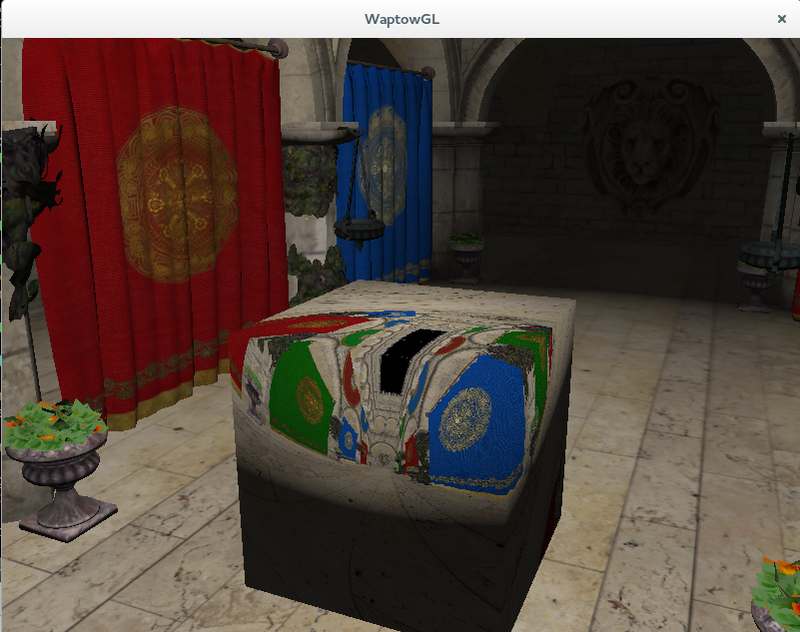 Now, I bind these textures, and I draw a cube which own my lights (I use only point lights), and configure your cube. Wait, What is a configuration for the cube?? It’s only the position of your light, with the radius. Now I can draw my cube and do computing. Yes but, I have a little problem. Indeed, a cube have « two opposite faces », so if I am out of your lights, my lighting is computing two times and it don’t provide a good result. You can see that I have one light more powerful when I am out instead in ^^. So, how can I solve this issue? Simply on using the Stencil Buffer. You clear your buffer with 0, and if any draw is make, you increment this value only if this value is 0. So when you compute once time on one pixel, you can’t perform another computing in the same pixel. So, now, I can introduce computing 😀 . Currently, my lighting algorithme is very simple, but I will complicate that later (with quadratique attenuation, normal / height map and other). But, I will talk about that in the next article. It is planned to talk about calculation, and optimisation. It’s not the best formula, and not the best technique, but I will explain how can I get a little formula, and how can I use this formula. Hello there, today, we are going to talk about too many things. Firstly, we are going to show you how our engine work, and how to compute a ray sphere, or ray plane intersection. We are going to talk about optimization too. So, to begin, we are going to explain how our engine is build. We use a technique called Deferred Shading. 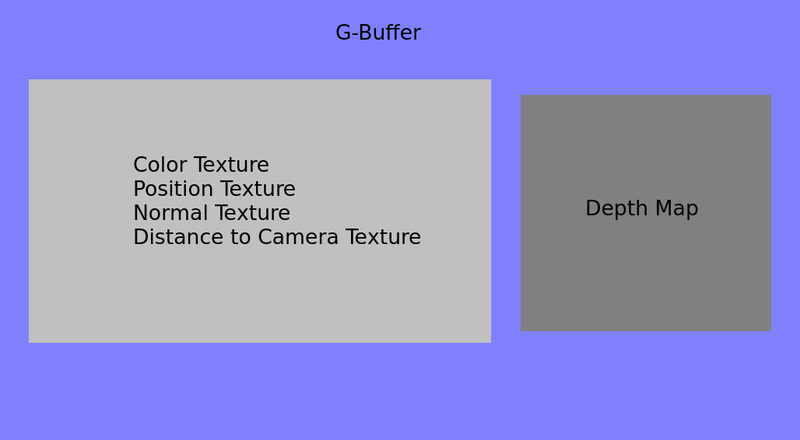 Into our GBuffer (it’s the name of buffer used in deferred shading), we have 4 + 1 textures. We can see that we have 4 important textures, and one less important. So, now, I’m going to explain what their utilities are. The Distance to the Camera Texture that contains the distance of camera for each position written in the position texture. The same applies to the depth map. (GL_R32F : float for one component). For example, here are 3 screenshots of Color, Position, and Normal textures. So, now, we are going to explain the multiple passes in our rendering algorithm. The first pass, is a rasterization pass, we use a vertex and fragment shaders to do this. As a reminder, vertex is a processor of vertex, it is invoked one time for each vertex (if you have 1 000 triangles, it’s invoked 3 000 times), and fragment shaders are invoked once time for each pixel. Our engine works in world space, so, positions, normals are in world position. So, now, we will explain the maths about Ray Tracing. As a reminder, here are the respective equations of plane, and spheres. So, your ray begin at position ro (position of Camera), and have a rd direction. Now, you just can solve for t the above equations, and you have a position of the intersection object. But, how can I get a rd vector?? The signification of « 1.0 » for the z component here is : « far plane ». Now, to optimize the sphere computing, you only have to draw one cube with rasterization, and, in a shader, you can do a computing, so, instead of computing of all your pixels, you compute only in a little area in your screen. It’s a power of deferred shading. It’s because you have to use a infiniteProjection (glm see around of infinitePerspective). For the plane, my advise is to use Compute Shaders instead Fragment shaders. Indeed, if you put plane in shared memory (equivalence to L1 cache), you obtain a little gain in performance. Indeed, shared memory is about 100 times faster than global memory, so if you have a big number of accesses of your buffers, it’s better to use shared memory ^^. Now, we can draw lights and shadows ^^. But it will be for the next article ^^. 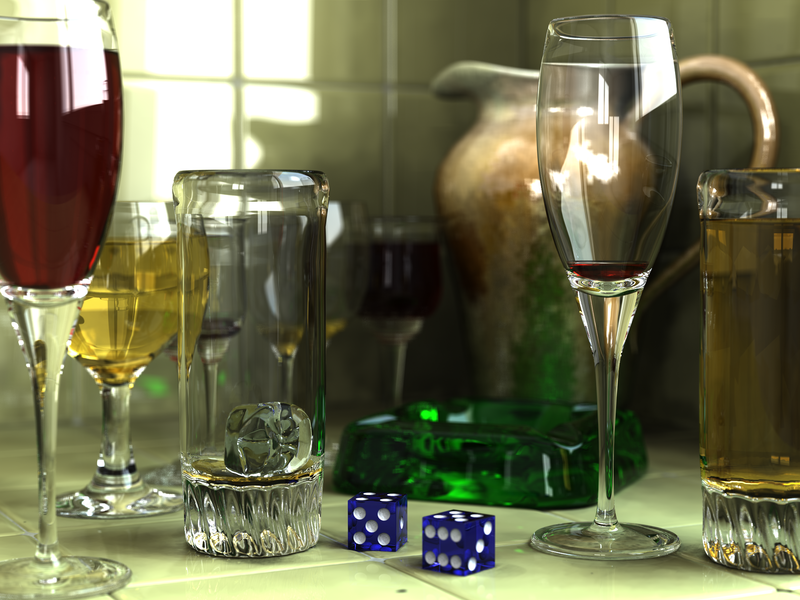 Today, we are talking about a choice to use ray tracing, or rasterization. We are going to begin to speak about rasterization. It’s a barbarian word, I know. But you use that every time, Indeed, current video games used this technique to « draw » at the screen the scene. It’s a good technique because it is very fast (several millions of triangles can be rendered at 60 FPS), but, it’s difficult to implement reflections, refractions and others. 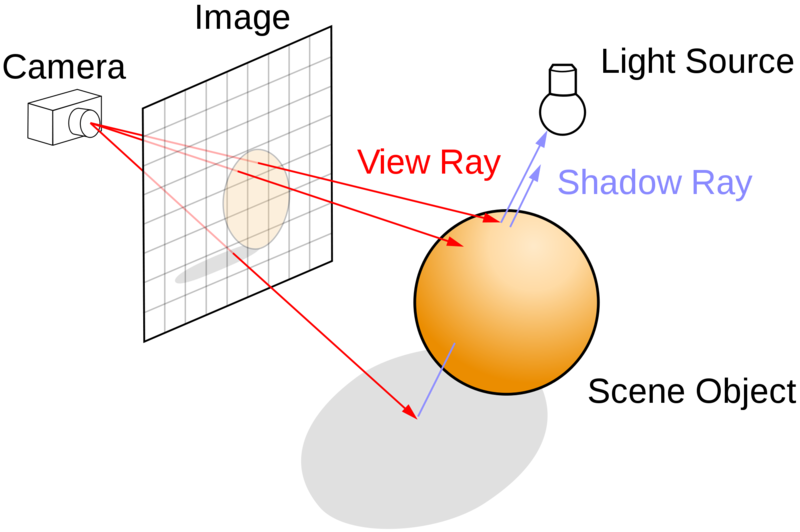 Ray tracing is one other technique to draw in the screen. The principle is to trace a ray in opposite direction of reality. Indeed, in the real world, photons started from the light, and arrive on the object. 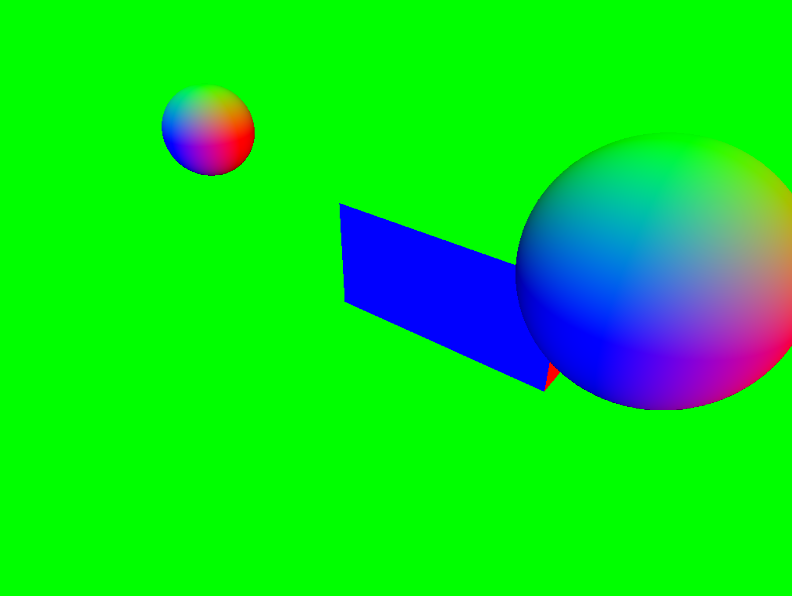 Ray tracing do other. Ray start from eyes (camera) and the finish way is the light. What is my choice ? I’m going to create one hybrid rendering. Indeed, my first ray will be create by rasterization, and shadows, reflections, refractions are ray traced. With that, we can obtain a render very quickly, after, we « just » have to optimise our algorithm to improve computes :-). We hope obtain this scene at 5-10 FPS (or much). This first article is meant to give you a bird’s view about the subjects we’ll deal with in this blog. You thought I’m going to talk about Global Illumination. Wait !! 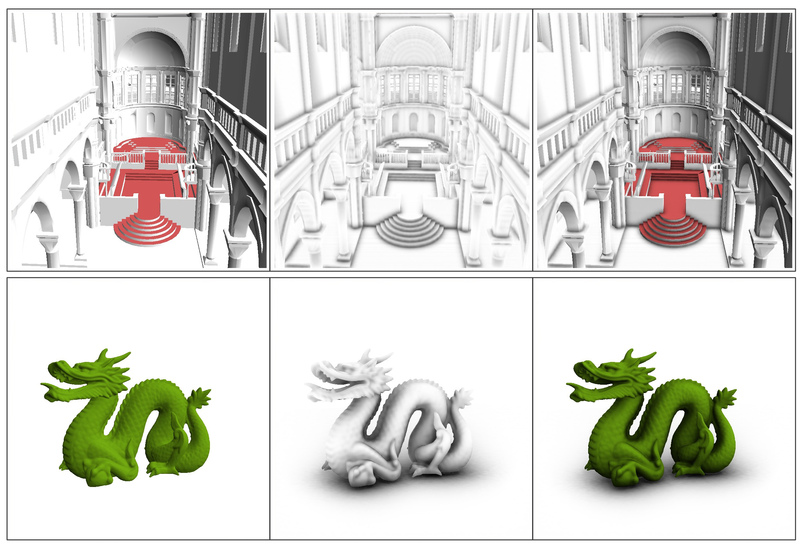 What is « Global Illumination »? Global illumination is one « idea ». Indeed, in cartoon, or in video games (they are more interesting to make global illumination in real time), you have reflections, refractions, and … soft shadows (they need too much computes, so, generally, you love disable this option). This scene is a good example of Global Illumination. You can see refraction, reflection and soft shadows. My name is Antoine MORRIER, I’m 20 years old and I’m student at Télécom SudParis, and I try to create a real time 3D engine with global illumination. I use for that, OpenGL 4.4 with GLSL.